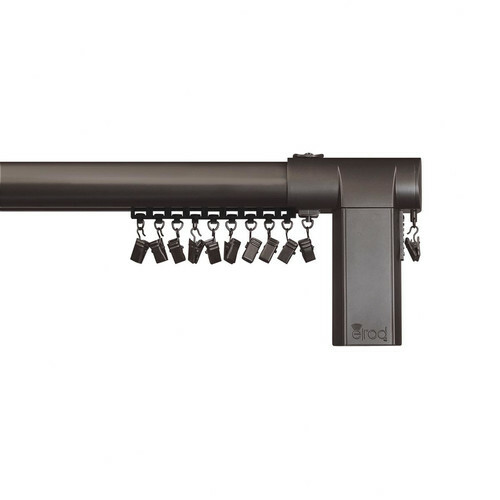 Features: -Durable metal rod and brackets to support your drapery panels. -Included clip rings fit most drapery panels. -Operates with included adapter plug or battery pack (sold separately). Product Type: -Hardware set/Single rod. Material: -Metal. Material Details: -Steel. Dimensions: Extension Bracket: -Yes. Finial: -Yes. Overall Height - Top to Bottom: -6\". Overall Depth - Front to Back: -2\". Maximum Bracket Weight: -20 lbs. Overall Product Weight: -10 lbs. Extension Bracket Height: -3\". Extension Bracket Width: -4\". looks good, arrived on time. still waiting for drapes to mount. I will update the review then. Home territory searches the web to find the best prices and availability on Window Hardware and related products foir your home like Beme International Motorized Erod Center Open Single Curtain Rod and Hardware Set. For this page, related items include products we find that match the following keywords: "Window Hardware" at our vendor partner Walmart - Click More Info / Buy Now to check for price rollbacks!. Beme International Motorized Erod Center Open Single Curtain Rod and Hardware Set is one of 144 Window Hardware and related products available for sale through HomeTerritory.com, If you have any questions on this product, please give us a call at 734-971-1210 during the hours of 9am - 5pm EST for assistance. Thank you for shopping at Home Territory, the home furnishings superstore!